The advantage to a solar pool heating system is, once we install it, your pool is heated for free, by the sun. With proper sytem sizing, solar pool heating gives you ten months of swimming for free. With a pool blanket during winter months, you can maintain a comfortable 82 to 85 degrees, even in the coolest weather. 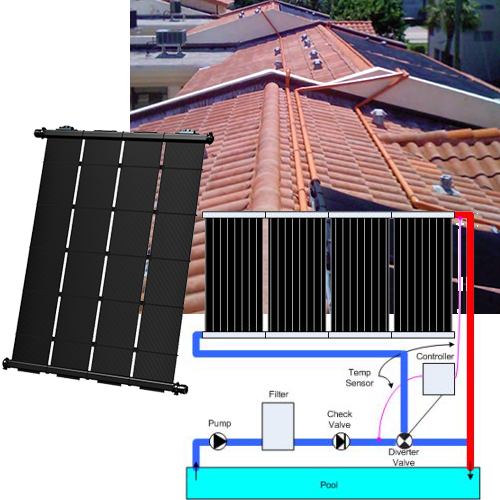 Solar pool heating works by moving the water in your pool through solar pool heating panels at a high flow rate. The cold water goes into the panels, and comes out at a higher temperature. The pool pump and filter that circulates your pool water moves the water through the panels, making it warm from the sun's heat.